Shakespeare wrote his tragedy Othello in 1603 and it ranks among the Bard’s finest works in the genre. Although the play is more than five centuries old, its themes of love and hatred, trust and betrayal, life and death are ones that man is still struggling to cope with today; ones that elude understanding let alone explanation; ones that are the cause of suffering, pain and poverty the world over in our supposedly progressive twenty-first century. Giuseppe Verdi, whose bi-centenary of his birth the artistic world is celebrating this year, expressed an enduring fascination and admiration for Shakespeare. In fact, Othello is the second of his operas that Verdi set to music on a Shakespearean text. Through the medium of opera, the audience is privileged to visualize the action that goes on in the play and hear the translation of Shakespeare’s text (in libretto form by Arrigo Boito) into beautiful music. There is a strong educational aspect to artistic form, whether this be painting, music, architecture or poetry. Opera brings all four art forms together – there is plenty to see, hear and appreciate in the set, lighting, costumes, design, technology, and, above all, in the music. 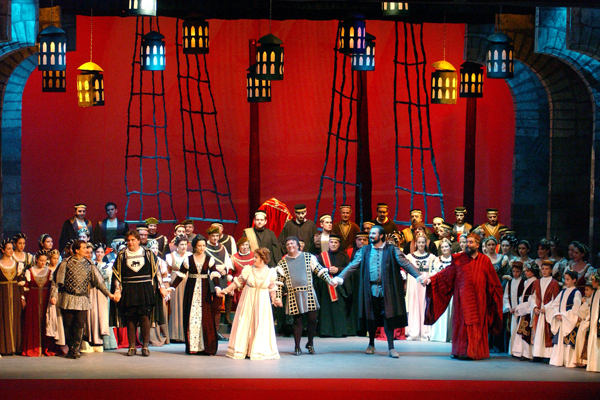 There is no better art form that manages to integrate the discrete yet complementary artistic styles than opera. Whether you are studying Shakespeare’s Othello at sixth-form or at undergraduate level at University; whether you are an aspiring designer or studying architecture; whether you are immersed in your theatre studies; whether you are an engineer student studying the mechanics of how things work; whether you are a technology buff very interested in computers and how these help opera become the modern and innovative art form it has become – now is the chance to enhance your interests, whatever they be! You will be pleasantly surprised to see many youngsters like yourselves taking part, either in the chorus, or in the set-building, or designing, etc!